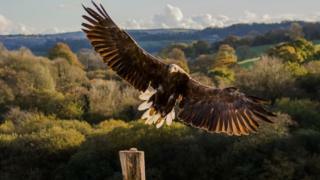 Two lost eagle species could be returned to Wales for the first time since the 1800s, researchers have said. Cardiff University is investigating whether the landscape could support the reintroduction of the golden and white-tailed species. The European population of both species is relatively small and in further decline, primarily due to human persecution and habitat loss. The researchers will carry out a feasibility study. Project leader Sophie-lee Williams said: "Wales is home to large expanses of potentially suitable eagle habitat but there are many questions we need to answer about the quality of habitat, and whether it can sustain eagles. "The project is in the very early stages of development, and a reintroduction is not likely to happen for some time." She added the potential reintroduction of the eagles would follow a licensing and consultation process. "However, if successful, the project could bring far-reaching benefits, helping to restore Wales' diminished biodiversity, regenerating local economies, and aiding the conservation status of both the golden and white-tailed eagle at a national and international level."